Q: Where does JECTZ® derive from? A: Fun Fact—JECTZ® Derives from the word PROJECTILE, we add the add the Z for originality and now it's plural. PROJECTILEZ. Q: Do you use real bullets? Q: What is JECTZ® Lifetime Warranty? A: We warranty each and every piece of JECTZ® Bullet Jewelry to be free of defects in material and workmanship for the life of the jewelry, and we will repair or replace with a new piece of JECTZ® jewelry, at our option, any JECTZ® jewelry that is defective. JECTZ® jewelry does not warrant its products against normal wear, misuse, or product modifications. If your jewelry was damaged due to misuse, our repair department can analyze the damage and repair it for a reasonable fee. If the jewelry is unable to be repaired, we will extend a one- time courtesy offer, allowing you the option to purchase a new piece of jewelry for 50% off of our MSRP price listed on the website, excluding any web specials. 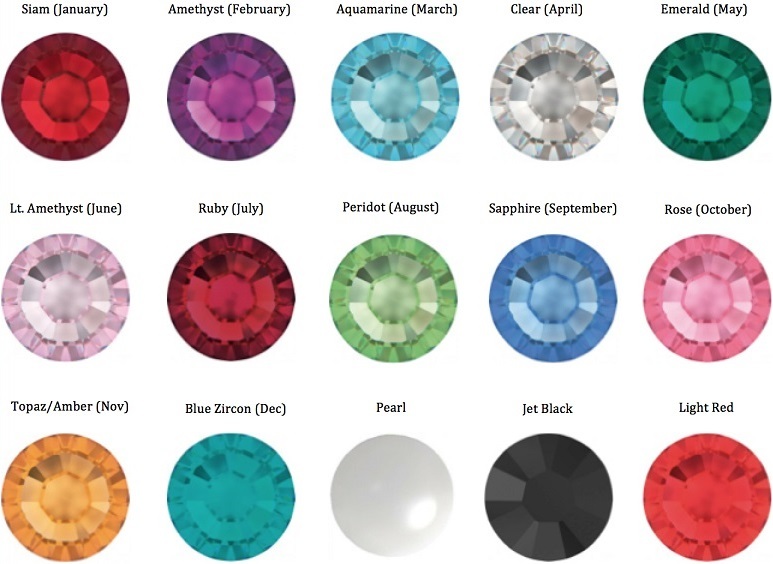 Q: Do you have a Crystal/Gem Color chart? Q: I Have a Question or Concern! How do I Contact JECTZ®? A: JECTZ® Customer Support Team is available to answer all your questions or concerns in a timely manner. Please Contact Us at support@jectz.com anytime, and one of our Team Members will contact you during regular business hours (Monday through Friday 8:00AM – 5:00PM PST, excluding holidays). Q: Is my Information Secure? Browse and Buy with confidence! A: Shop Safely and Securely. jectz.com takes great pride in offering a safe and secure online shopping experience. jectz.com is Active with GeoTrust! Located at the bottom of our website. jectz.com uses Secure Sockets Layer (SSL) technology to provide you with the safest, most secure shopping experience possible and secured by GeoTrust SSL certificates are providing up to 256 bit encryption thereby offering the highest level of encryption and security possible. This means you can rest assured that communications between your browser and this site's web servers are private and secure. Q: Something is wrong with my jewelry what should I do? Q: What is the Choose Options tab under each product? A: By clicking on the Choose Options allows you to select from many options such as: Necklace & Style Length, Ring Size, Caliber, and No Gem or Gem of your choice. Selecting the "No Gem" option will show the once fired "striked" primer, Selecting a Gem of your choice will cover primer. If you are wanting a specific brand of caliber on your jewelry please request it by contacting us on our contact page. It is our discretion to use a different brand as shown on pictures. Q: How do I clean my Bullet Jewelry? A: Here are a few things to keep in mind. The types of metal we use such as Sterling Silver will tarnish over time and never rust, Stainless Steel will never tarnish and will not rust. However, the bullet casings we use are real bullet casings that are once fired and contain Brass or Nickel. Brass and Nickel will always tarnish and rust over time. Water is the biggest culprit. If you wash your hands or shower with your jewelry the bullet in time will begin to tarnish and rust. The only way you can prevent this is not to get the bullet head itself wet. If this does happen it's ok and you can clean it with brass polish or a polishing cloth to shine it back up. The longer you wait to clean your jewelry the more difficult it will become to remove the tarnish. If you get your jewelry wet, be sure to dry off immediately. Or simply follow our Return Policy and JECTZ® will clean your bullet jewelry for free! Q: I want to know if you can use my bullet casing that I have? A: Yes! We can use your bullet casing on most of our products at no extra charge. We would be honored! All you need to do is contact Customer Support to direct you with shipping and ordering for your custom casing. Q: IF My finger turns green ring is it not Sterling silver? A: Sterling Silver is Elegant, however pure silver is too soft and can easily scratch and become damaged. It's alloyed with copper to make sterling silver a combination of 92.5% silver with an added amount of 7.5% copper which is stamped with a mark .925. Stay Calm, This "green finger effect" is a reaction to the copper alloy in the sterling silver if you have high body acidity . Statistics show it happens to about 1-3% of people due to increased of chemicals in our environment and food we eat. The ring can be soaked for a day or two in a 50/50 mixture of household ammonia and water to take care of the issue. Apply a thin layer of clear nail polish on the inside of the ring to prevent perspiration from reaching the metal and reacting to it. Always keep your jewelry clean to prevent your jewelry from tarnishing. Reactions are rare but does happen when someone eats something with high acidity, types of medications or due to high energy or being excited. A: Need to check our Return Policy? Please click here. A: Once your order ships you will receive a shipping tracking number to your email that you provided at the time you placed your order. If you have received a tracking number and your package did not arrive to the address on your order or if you did not receive a tracking number within 2-5 business days please Contact Us immediately. The Customer Support Team will do their best to get the problem resolved. Q: How long does it take to for me to get a refund? A: It may take 2-7 business days for your return to reach the JECTZ® Return Department. Once it is received and inspected (usually within 72 hours of receipt) your refund will be processed and automatically applied to a store credit. A: If you are unsure of your ring size, you can measure your ring size because the finger is round, Finding your ring size using paper or string or can only approximate your true ring size. Our rings are true in size, sizing may vary accordingly from other rings you may have. 5. Locate your ring size by locating your measurement on the printed chart. If the measurement falls in between two sizes, it is recommended that you choose the larger size. Or: Find a printable ring chart or use a ring at home that is true in size, a jeweler. Q: How do I know my bracelet size? A: Follow steps above on how to size your ring finger except on your wrist.